ChemWorld Outdoor Boiler Stove Furnace Anti-Corrosion Chemical Treatment – Please choose container size before ordering. 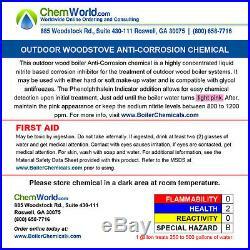 ChemWorld Outdoor Wood Boiler Corrosion Inhibitor Chemical is a highly concentrated liquid buffered Nitrite/ Borate/ Silicate inhibitor designed for closed loop or open loop Wood Stoves or Wood Boilers with minimal water loses. Designed to work in all makes and models of outdoor wood furnaces and stoves. Formulated to provides proper corrosion protection for copper, mild steel, stainless steel and aluminum. It may be used with either hard or soft water and is compatible with glycol anti-freezes. Contains a “dye” Indicator for ease of proper dosage detection (turns your water a light pink). For systems closer to 500 gallons or if your ground water is low in alkalinity the water may not turn pink, although there will be adequate corrosion protection. Safe for yearly storage if stored in cool, dark area. Just add direct to your system. Product meets all D. We are a muti-million dollar company. 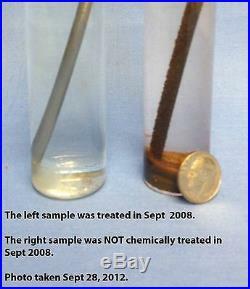 Do trust your chemicals to just anyone! 64oz treat 125 to 250 gallons of water. We have 10,000 plus units in the field with 0 complaints! Here is a list of 20 FAQ. How often should I replace out this Wood Boiler Chemical? Nitrite will not convert to nitrate for 4 to 8 years depending on the boiler system. To be on the safe side, we recommend dumping and replacing your water and chemistry every 5 years. When I added the Wood Boiler Chemical last year it was a light pink. When we fired up the system up, the water was clear. Do I need to add more of the Wood Boiler Chemical? In most cases No. If you evaporated more then normal water off your system, it is possible you added additional makeup water. The component of the chemical that turns the water pink, is a P-Indicator commonly used to determine total alkalinity of water. If you add more low neutral pH water you may have decreased the overall alkalinity of the system’s water. If the water dips below around 9 pH, the P indicator will not be visible. This does not mean you need to add more chemical? Remember the chemical passivates your metal, pH is not as important. In the real world, if you have above 8 pH our experience shows you will have good corrosion protection. The P-Indicator is just used to simplify chemical testing and is not required as part of quality of the chemical treatment. If your water is clear, use a standard nitrite test kit or nitrite test strips to verify you have proper nitrite residual. If I over feed the Wood Boiler Chemical will it cause any problems? If you grossly over feed the chemical you will increase corrosion rates to any copper or bronze metals. In this condition, if you are using our chemical the water would be a deep red or purple instead of a light pink or pink color. If water is a deep red or purple, bleed off some water and add additional fresh water until the color lightens. What is the shelf life of the chemical? 5 to 8 years if you keep it a cool dark area. If you store the chemical in a hot area, the chemical P-Indicator will turn brown over the course of a couple years. The chemical is still good, but the water will not turn pink. Is nitrite a source for bacteria development? Yes, nitrite is a source for bacteria development, but in this application your water system is closed and there is not enough replenishing dissolved oxygen to create much, if any, bacteria within your system. When you fire up your system, the hot temperature will kill any bacteria or slim within the water system. How should we layup the system when out of use? If you are not planning on using your system for more then 8 months or greater, you should consider dumping the water instead of leaving it filled with water. Is this Wood Boiler Chemical compatible with my existing chemical or antifreeze system? There are only a handful of different chemicals out there and you can just add ours without dumping the existing water. Should we use antifreeze in our boiler system? We have heard antifreezes causes you to use more fuel source to maintain proper heat, but we have no data to support this in either direction. Now, if you leave your residence or facility unattended, you may consider at least using a 20% antifreeze solution. What type of Antifreeze should we use? In general, there are 2 common used types, ethylene glycol and propylene glycol. Use a 99.9% food grade propylene glycol solution or a 95% corrosion inhibited propylene glycol solution. Do not use ethylene glycol. Ethylene glycol may kill animals, pets, or humans if spilled and consumed. Every year we get calls from a hospital about a person who accidentally drank their boiler water through some sort of water cross contamination. Every year we get complaints about some premixed solution that promised freeze protection to -40F and pipes bursted during a cold spell. Typically, the premixed lower cost antifreeze is recycled antifreeze. There is good stuff out there, just test it out first to make sure it will work for your system. Also, remember there is a difference between freezing and burst freezing points. This temperature range can be as much as a 20 to 30 F difference. Is this Wood Boiler Chemical compatible with antifreeze? Do we need to use an oxygen scavenger such as a sodium sulfite based product? You are not making up enough water to require using an oxygen scavenger. Dissolved oxygen enters the system through fresh water and system air intake leaks. If you are only making up minimal water, you are only adding a very small amount of dissolved oxygen (parts per billion). Oxygen scavengers are required in higher volume steam generation boilers. What type of chemical testing is required? With this chemical, just add it until the water turns a light pink or if you are using a nitrite test kit maintain between 600 ppm and 1200 ppm of Nitrite. Do I need to check pH? With this chemical, no. This chemical passivates the metal. As long as the pH is above 8 your system is fine. My system is rusted. Should I remove the rust prior to using using this Wood Boiler Chemical? No, we do not recommend remove the rust by means of acid cleaning. The damage is done and is irreversible. We have seen many cases where the system is cleaned and put back in service only to have pin hole size leaks are now. Many times the rust and corrosion is holding the metal together and is preventing the system from leaking. I have a stainless steel wood boiler. Do I need to still chemically treat the system? In some cases, the stainless steel used is a lower grade stainless steel and you may have iron leaching from the exterior to the interior of the boiler. This chemical will work excellent on stainless steel systems. Should we use softened water, RO water, ground water, or city water? If you have good ground or city water, it is safe to use within your boiler system. Softened water is also good if your water is hard, but not necessary. Avoid using deionized or RO water. Our manufacture of our wood boiler no longer exists or recently went out of business? Or the supplier of our previous Wood Boiler Chemical no longer exists? Can we use this chemical in our system? Unfortunately, due to recent changes in EPA regulations on manufactures of outdoor wood boiler some are closing their doors in 2011. 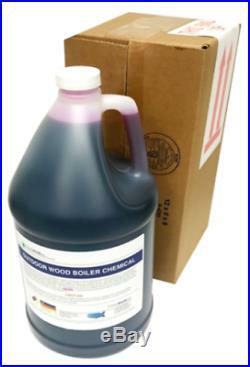 Regardless, our boiler chemical can be used in all wood boiler or corn burner systems. How do we know your Wood Boiler Chemical will work? How important is our water cleanliness? Water cleanliness is important to reduce erosion within your water system. Debris such as dirt or rust particles should be filter or flushed from the water system. Also, if your water has been sitting idle for a few years and it has a bad odor. Dump the water and replenish the system with fresh water. No, This product is not a haz-mat product. Can I use this in my commercial or industrial boiler? This product ships from our SouthEast & East coast stocking location in Atlanta, GA. For West Coast and Midwest customers, please order from our Salt Lake City Location. The item “ChemWorld Outdoor Boiler Stove Anti-Corrosion Chemical Treatment” is in sale since Monday, November 08, 2010. This item is in the category “Home & Garden\Home Improvement\Heating, Cooling & Air\Other Home Heating & Cooling”. The seller is “chemworld-atlanta” and is located in Roswell, Georgia. This item can be shipped to United States.